That Bullfrog’s (Syndicate, Theme Park) original Theme Hospital was released way back in the same year that Duke Nukem Forever was first announced – 1997 -- should provide some consolation for those of you who feel they have waited far too long for an update to this classic sim game. As a successor to one of the few games that remain playable today, despite the obviously dated graphics, CodeMasters have quite high expectations to live up to. But is Hospital Tycoon the miracle recovery after a 10-year coma? Or do we turn off the machine that goes “ping!”, call a code and order in a re-supply of body bags? In Hospital Tycoon, much like its predecessor, you have to set up and run a hospital, making sure all the patients who walk in your front door leave the same way. You build rooms, buy a variety of crazy medical devices, hire doctors and nurses, janitors and receptionists, and generally try to keep things running smoothly so that patients don’t die on you. Equipment and salaries cost you money, while curing patients brings it in. Simple. So what’s changed in this new, updated version? 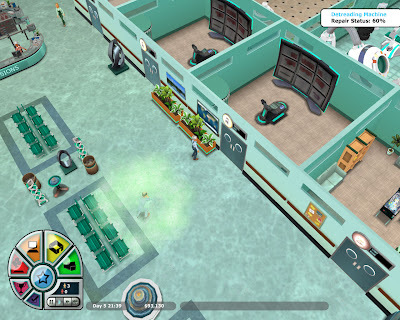 As far as graphics go, Hospital Tycoon’s visuals are a clear improvement on the decade-old original. As expected, this iteration sees a move from sprites to polygons. While it won’t be winning the “Polygon Pusher of the year” award for 2007, the graphics fit very well with the mood of the game. Big heads and exaggerated animations add to the humour, and sparkly animated effects on patients and machinery make the suffering of your sims thoroughly enjoyable. It’s the gameplay, however, where Hospital Tycoon differs most significantly from what you might expect. While the basic functionality remains the same, you now have far less control over the hospital-running aspects of the game. Doctors essentially do their own thing, and while you can tell them to walk somewhere, you cannot tell them to treat a specific patient who’s near death at the end of the queue, or work in a certain room. Instead, the control focus is on having staff interact with other staff – you can make them fight, tell jokes, fall in love, etc. While this is a neat idea to a degree, it adds nothing whatsoever to the gameplay. Your staff will still do all this without you telling them to, and you can play through the entire game without ever using this feature except where specifically directed to do so by the level objectives. There are no options that allow you to manage the economy of your hospital, nor to set the direction of your research: all research is now conducted automatically by one researcher when a patient with an unknown illness comes in. In fact, about the only aspect of this game where you have more control is in the decorating – you can now buy a variety of posters, plants and decorative features to improve the “beauty” rating of your hospital. All in all, this game was a fun disappointment. The 'story' for the level-based part of the game is weak, uninteresting, and does not impact on the gameplay. 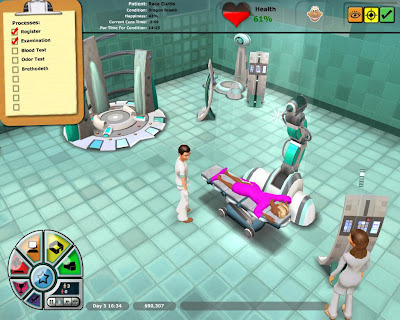 For all the effort put into making staff with individual personalities and customisable hospital rooms, you lose any changes you made to these characters and rooms after each level, with the next starting with a default set-up. Despite this, the underlying gameplay is still solid and enjoyable. For all Hospital fans I've coded another fine tool. How can I pack my edited *.dds-Files to a *.pak-File back??? You cant, its just extractor. then this tool is useless! or is there any tool which can pack it back to .pak? then this tool is useless!"